Goldfinch Cottage is a modern 2 bedroom, newly converted single storey barn conversion which overlooks one of our three fishing lakes. Fully equipped to a very high standard to make your stay with us a relaxing and pleasurable experience. WI-FI guest internet. Fishing rights are all included in your holiday package. Master bedroom with super-king size bed and a twin bedroom plus a sofa bed in the lounge if required. All Egyptian cotton bed linen, towels and kitchen linen are provided. Travel cot and high chair available on request. The kitchen comprises of electric oven, induction hob, dishwasher, microwave and fridge, lots of cupboard storage and granite worktops. Nespresso coffee maker with pods. Unlimited hot water. Separate spacious utility with washing machine and deep freeze, iron, ironing board, clothes drying rack. TV with freeview in lounge and bedroom 1. All fully equipped, just bring your food along! A welcome pack will be waiting for you on arrival. Constant underfloor heating and hot water from our ground source supply. The accommodation is nestled in our 50 acre site with a wealth of footpaths and wooded areas for you to enjoy the outdoors, and grazing horses and free range chickens just outside your door. The famous public footpath 'The Monarch's Way" crosses through our farm. If its a peaceful holiday you're after but not too remote were the right choice for you. The village pubs and a shop are a short walk away. The famous gastro-pub the Chequers Inn serves excellent food and is featured in Alistair Sawday pub & restaurant guide and the Good Food Guide. Log fires in the winter and a very attractive garden with comfortable sofas and tables to make the most of alfresco dining. Dogs are also welcome here. Also we have the Maltstone another gastro pub and bar with fantastic pizza oven where you can watch your food being cooked. The local shop/post office is well stocked and alongside you will find Lord Mortons Tea Rooms where the cook breakfast, snack or full English cream teas. There is also an interior design/gift shop in the village if you want to treat yourself to something special. The nearest town Droitwich Spa is just a 5 minute drive away with shops, banks and supermarkets including Waitrose, Boots, (Marks and Spencer and Sainsbury's mini food markets) Aldi, Morrisons. Plenty of petrol stations here too. We are situated in the heart of beautiful Worcestershire but with easy access to the M5. The nearest junction is just 7 minutes away. This makes us ideally located for exploring many local attractions such as Birmingham, NEC, the Cotswolds, Shakespeare's Stratford-upon-Avon, Cathedral city of Worcester, Malvern Hills, Cheltenham, Black Country Museum, Cadbury's World, West Midlands Safari Park, Go Ape, theatres, Severn Valley Railway just to name just a few. Well behaved pets may be allowed by prior arrangement. Ample car parking space for two cars by the cottage. Please ask for quote for a 3 night stay. We have lived here for the past 25 years and have seen several changes. The latest one being the conversion of our barn into 5 holiday lets. I live here with my husband Nick and together we run our fishery and our small holiday let business alongside a small livery business. We are surrounded by happy people enjoying holidays or taking part in their hobbies. We are born and bred here in Worcestershire and have never felt the urge to live elsewhere. We love the outdoor life that we have created around us. We bought the farm 25 years ago and raised our children here and just love the location for it's tranquility and beauty. Nestled in a small village in the heart of beautiful Worcestershire with it's rolling, undulated landscape. With a wealth of footpaths, three lakes and woods on our site but yet only a few minutes drive to a motorway network that will take you to major cities and attractions. Family bathroom with large walk in shower with overhead and lower shower heads. W.C. and basin, electric towel rail and underfloor central heating. Shelving and towel rack. Fishing rights to all three pools. No specific pegs are allocated to guests. Delightful surprise on arrival as surpassed expectation. Situated overlooking landscaped fishing lake from living area. Bedrooms and side of living area look out onto stables. Lovely to be greeted by the friendly ponies when opening curtains each morning. Pleasant modern interior. Welcome pack of milk, biscuits, cake and crisps. Complementary tea, sugar and coffee pods for nespresso machine. Pleasant stroll around the lakes. Easy reach to lots West Midlands attractions. You really could wish for more. The property is really appointed... very quiet and a great location to explore the area. 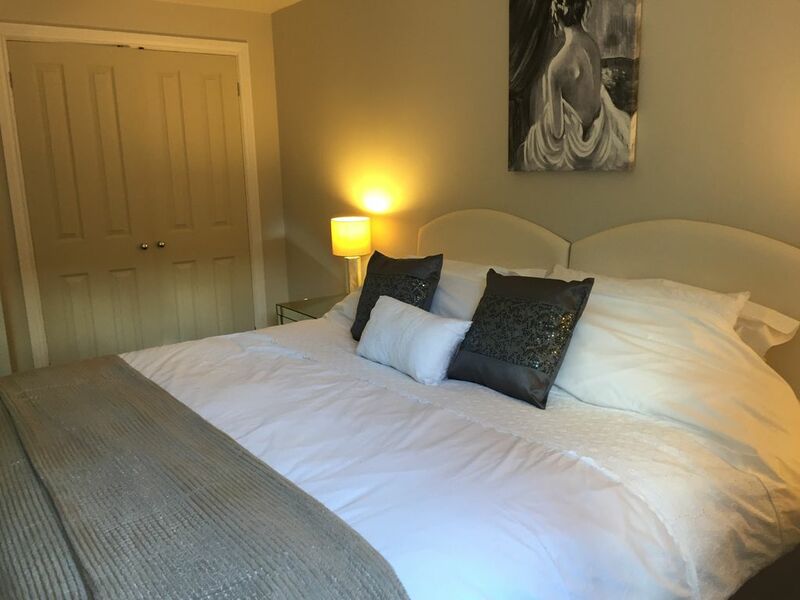 Beautifully presented holiday accommodation set in a lovely peaceful setting. Warm, comfortable, lovely dog walks from the door. We would certainly recommend this accommodation to our friends. The situation of the property lends itself to exploring the surrounding countryside of the Malvern Hills, Cotswolds, Ludlow, vale of Evesham, all very beautiful. The owners were helpful at all times and not at all intrusive. Thank you Gaynor and Nick.